Right now, more than 6.5 billion people are competing for the Earths dwindling supply of fossil fuels. By 2050, it is estimated that there will be 8 to 10 billion, and major advances in energy technology will be required to meet their needs. Rensselaer Polytechnic Institute has faced that challenge by launching and expanding programs in renewable energy sources and energy conservation. Today, Rensselaer announced the signing of an exclusive license agreement with Concentrating Solar Power Utility for a new solar power technology utilizing what is known as magnetohydrodynamics (MHD). 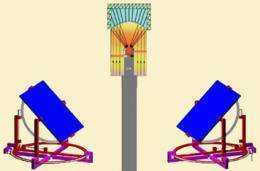 The promising technology uses superconducting magnets to increase the efficiency of conversion from sunlight to electricity by stripping electrons from high-energy plasma jets and thereby generating power with no moving parts. The three co-inventors are Concentrating Solar Power Utility founder Thomas P. Kay and two Rensselaer faculty members: Douglas Chrisey, professor in the Department of Materials Science and Engineering and the Department of Biomedical Engineering, and Yoav Peles, associate professor in the Department of Mechanical, Aerospace, and Nuclear Engineering. Magnetohydrodynamics (MHD) is derived from the terms magnetomeaning magnetic field; hydromeaning liquid; and dynamicsmeaning movement. MHD uses magnets and plasma to extract electricity from superheated charged gas, and allows the generation of power directly from a body of hot gas without the need for any moving parts. A key benefit of MHD is its ability to operate at higher temperatures, which makes it a strong fit to use in solar power generation. Magneto-Hydro-Dynamics (MHD) is derived from Magneto-meaning magnetic field, Hydro-meaning liquid, and Dynamics-meaning movement. MHD generates electricity directly from a body of very hot moving gas without any mechanical moving parts. Magnetohydrodynamics works by using magnets to extract electricity from superheated charged gas. In a sense MHD replaces the wires used in conventional electrical generators with ionized gas. This rendering depicts the solar MHD device that uses power from the sun to generate electricity. The system can also run on biodiesel or jet fuel jp54. In addition, it can also be used as a topping cycle to improve the efficiency to existing power plants. In developing this technology, the use of the extremely large superconducting permanent magnets will improve efficiency, and this is even more so when combined with the micro-channel cooling process developed by Professor Peles, said Chrisey. The team has been working on the project for more than two years. Some of their joint work was, in turn, based on two earlier MHD patents held by Kay. Because of the higher temperature, generated solar MHD is more efficient than other types of solar thermal technologies that work at a much lower temperature. The laws of thermodynamics tell us that to generate power from a heat source, such as a burning fuel, the higher the temperature, the more efficient it will be, and that is the key advantage of this green technology, said Kay, who has worked in solar power since the 1970s. Pictured here, MHD generates electricity directly from a body of very hot moving ionized gas without any mechanical moving parts. 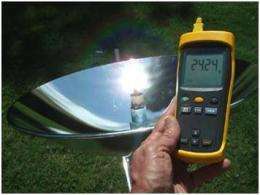 Solar energy, concentrated by mirrors and lenses, creates superheated gases; magnetohydrodynamics works by using superconducting magnets to extract electricity from the superheated moving ionized gas. Founded in the 1990s, the Office of Technology Commercialization resides within the Intellectual Property, Technology Transfer, and New Ventures portfolio. Along with the Rensselaer Technology Park, the OTC helps the Institute protect intellectual property and forges relationships with industry to bring Rensselaers discoveries to the marketplace. The OTC also contributes to the local economy by spinning off new companies generated from the research on campus. Discoveries in nanotechnology, electronics, energy, biotechnology, and terahertz are all part of the Institutes expanding intellectual property portfolio as Rensselaer increases its aggressive research initiative. With the establishment of the OTC, Rensselaer has staked its claim in the changing landscape of American research universities, where researchers are increasingly encouraged to protect their discoveries and hopefully effectively license them to industry for life-enhancing products. This year, through OTCs efforts, licensing revenues and patent reimbursements paid to the Institute are expected to be approximately $1,722,900, building upon a steady annual growth rate of more than 18 percent since 2002 when Rensselaer only generated $62,000. Since 2000, more than 1,200 inventors have filed patent disclosures with the OTC. In addition, more than 200 patents have been issued and Rensselaer has over 70 active licenses and averages 12 to 15 new deals a year, according to Kudla. And thanks to the OTC, Rensselaer Professor Chrisey and Professor Peles, along with Kay, are one step closer to their dream of developing an innovative and cutting-edge solar energy system. All of this is nice and I hope that eventually something useful will come out of all this. However, oil is still king. Also, who says that the Earths supply of fossil fuels is dwindling? What I have seen over the past forty years is that the amount of oil reserves has gone up and not dried up as was predicted forty years ago. I suspect that the standard dogma that oil is squashed dinosaur is wrong and that whatever made oil is still making it. In other words that oil could very well be a renewable energy source. No technical info and a bunch of fluff. So we should just stick with polluting technologies and not bother to develop anything new? Any other brilliant ideas? Actually, the basic description of MHD is very good as I see it. MHD is not complicated, and it is well-known. I'm wondering why the real problem stated in the article is not being addressed.